Indricotherium prehistoric rhino. Computer illustration of an Indricotherium amongst trees. 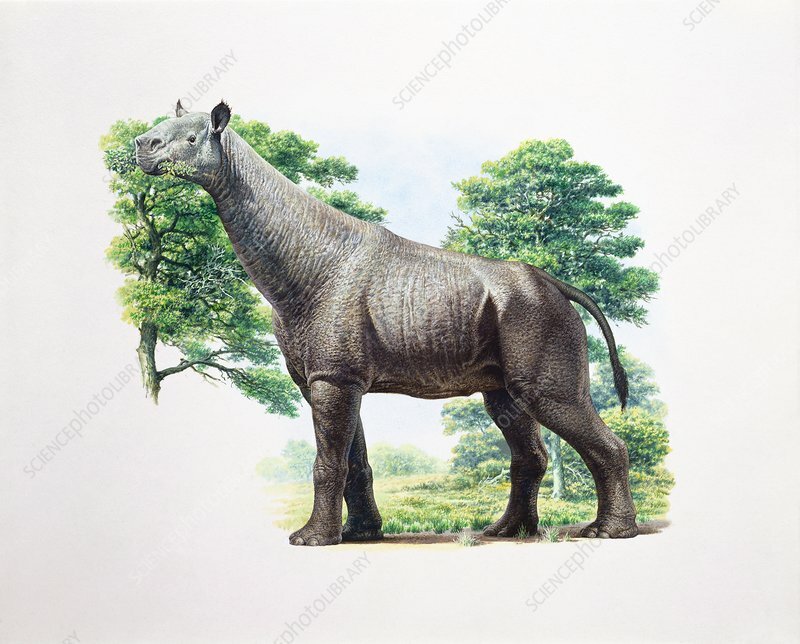 Indricotherium is a giant herbivorous hornless rhinoceros that lived in the forests of central Asia between 34 and 23 million years ago. It weighed around 20 tonnes and could stretch its long neck to reach leaves high in the treetops. Adults are estimated to have reached 5.5 metres tall at the shoulder and 9 metres in length from nose to rump making it one of the largest terrestrial mammals that has ever existed. Remains have been found in Balochistan (Pakistan). It is also known as Baluchitherium or Paraceratherium.